The ASUS VZ27AQ is a great monitor for everyday use, office work, and gaming; its 1440p resolution offers stunning detail clarity while the IPS panel ensures vibrant colors and wide viewing angles. Based on an IPS panel with true 8-bit color depth and 100% sRGB color gamut, the ASUS VZ27AQ monitor delivers accurate and consistent colors making it fit for entry-level color-critical work. 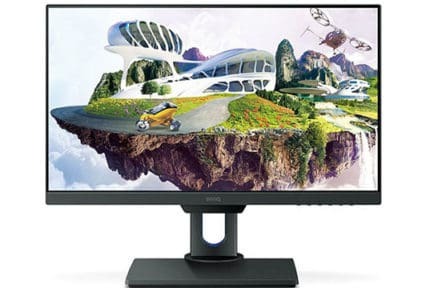 However, if you are concerned with color accuracy, there is a better and equally priced 27″ 1440p IPS monitor available for professional photo/video editing – the BenQ PD2700Q with 10-bit color and additional useful features. The IPS panel technology also ensures wide 178-degree viewing angles and a quick 5ms response time speed for minimal trailing of fast-moving objects. Other panel-related specifications include a decent 250-nit peak brightness and a static contrast ratio of 1,000:1 which is standard for a display at this price range. 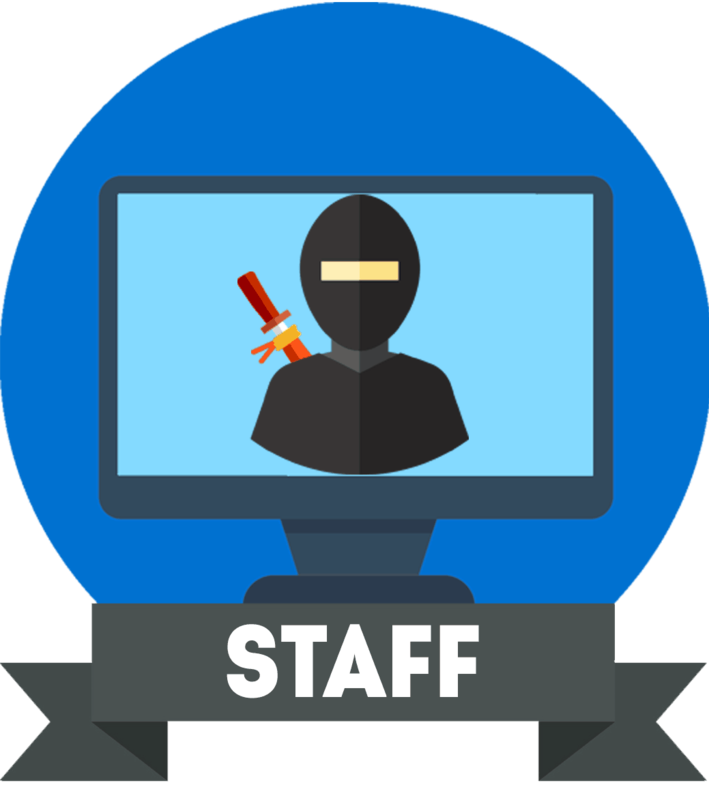 On a 27″ screen, 1440p resolution results in a pixel-per-inch ratio of roughly 109 PPI which makes for plenty of available screen space and clear details, without any scaling necessary. The ASUS VZ27AQ has a fairly low input lag of ~11ms which is imperceptible. In addition to the quick response time speed, the gaming experience is as smooth and responsive as it can at 75Hz. 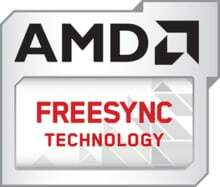 If you have a FreeSync-compatible graphics card, you will be able to synchronize the monitor’s refresh rate to your GPU’s frame rate. As a result, you get a variable refresh rate (VRR) which gets rid of all screen tearing and stuttering within the dynamic range which in this case amounts to 48-75Hz/FPS (Frames Per Second). Note that FreeSync only works over DisplayPort on this monitor. Our ASUS VZ27AQ unit kept disconnecting when using FreeSync with an NVIDIA FreeSync-compatible GPU, but your mileage may vary depending on your particular model. To be clear, you can use the ASUS VZ27AQ with NVIDIA graphics card, but you most likely won’t be able to use the variable refresh rate technology unless you have an AMD card. The OSD (On-Screen Display) menu is user-friendly and navigatable via the somewhat clunky buttons placed beneath the bottom bezel. Besides the standard contrast/brightness, color temperature, sharpness, etc settings, there’s the ASUS GamePlus feature which consists of customizable crosshair overlays and on-screen timers. Additionally, there are eight pre-calibrated picture presets (Scenery, Theatre, Night View, Standard, Game, sRGB, Reading, and Darkroom). 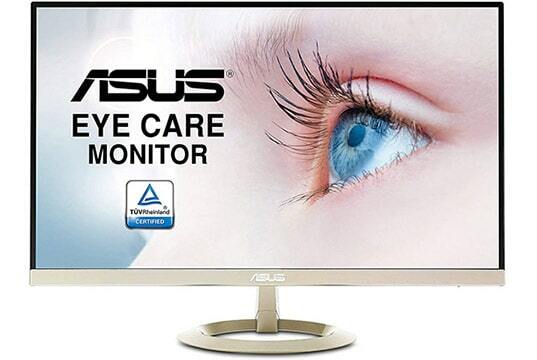 One of the more unique features of the ASUS VZ27AQ IPS monitor is the EyeCheck feature which consists of three eye tests for the short and long-sightedness. It can place three tests including Snellen Chart, Amsler Grid, and Astigmatism on the screen, and while they won’t get you out of visiting your eye doctor, it’s an interesting addition. The screen is flicker-free and has a low-blue light filter; these two features prevent eye fatigue and headaches caused by prolonged use of the monitor. The ASUS VZ27AQ has a very slim (7mm at the thinnest point) design with ultra-narrow bezels. Unfortunately, it’s tilt-only and it’s not VESA mount compatible. The screen has a 3H matte anti-glare coating which eliminates reflections. Connectivity options include HDMI 1.4 (max 60Hz at 2560×1440), DisplayPort 1.2a (FreeSync, and up to 75Hz at 1440p), VGA (max 60Hz at 1920×1080), a headphones jack, and two 2W integrated speakers. The ASUS VZ27AQ price is around $330. 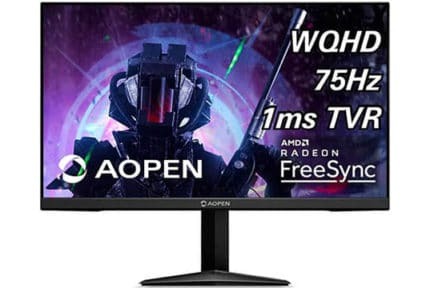 It used to be one of the most affordable 27″ 1440p displays, but nowadays, you can get the AOPEN 27ML1U which is also a 27″ 1440p IPS monitor, but it’s available under $250 and offers HDMI 2.0 (with FreeSync over HDMI) support, a backlight strobing technology, 10-bit color, VESA mount compatibility, and more. 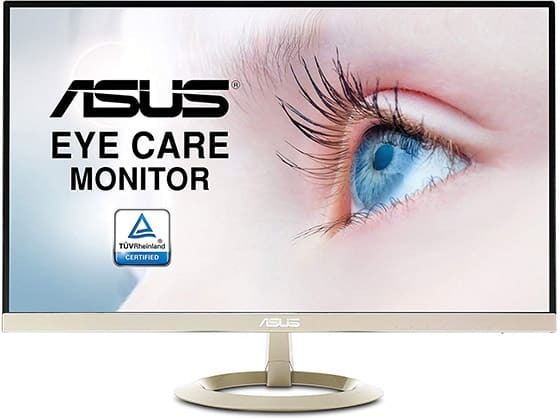 You can also get a 32″ 1440p IPS monitor with FreeSync, the AOC Q3279VWFD8, for under $250. While the ASUS VZ27AQ is an excellent monitor with a great image quality, smooth performance, unique design, and plenty of features, there are better alternatives out there. So, unless you stumble upon it on a sale for under $250, check out the monitors we’ve mentioned above. 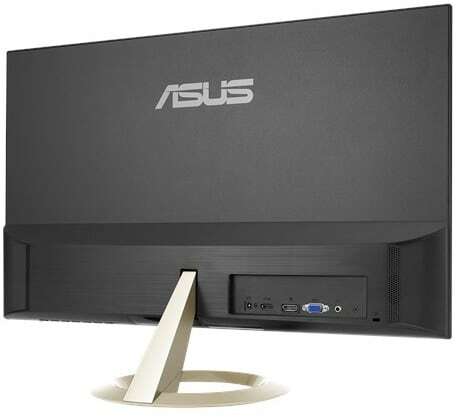 The ASUS VZ27AQ is an overall decent 27" 1440p IPS monitor, but there are better alternatives available for the money.